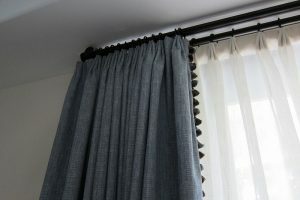 Drapery Fabrication – Ray Ev, Inc.
Ray Ev has a fully equipped drapery wo rkroom and our experienced workroom can provide drapery fabrication to your measurement and styles. Ray Ev, Inc. offers drapery manufacturing of Customer Own Material (COM). When supplying Ray Ev with your own fabric (COM), we are hired to sew panels only. We are not selling a finished product. Ray Ev will not be responsible for customers own fabric. We will inspect fabrics to the best of our ability. We will not be responsible for fabric quality and/or the performance of the fabric, such as flaws, imperfections, stretching, and flaring. We will not be responsible for shortage sent from the mills. When purchasing your own fabirc, you are responsible for the quality of the product.